Heels and mounts made to fit client's own footwear. This example produced for Katharine Hamnett. Mat: Chrome plated steel, Swarovski crystals, gold plated heel mount, high strength fastenings. Belt buckle with ICE lettering created for US rapper ICE T. Belt designs for individual band members of body count followed in addition to the mask project for bass guitarist D roc. The belt pictured was the start of further accessory design see below link including the mechanical face mask made for the band. 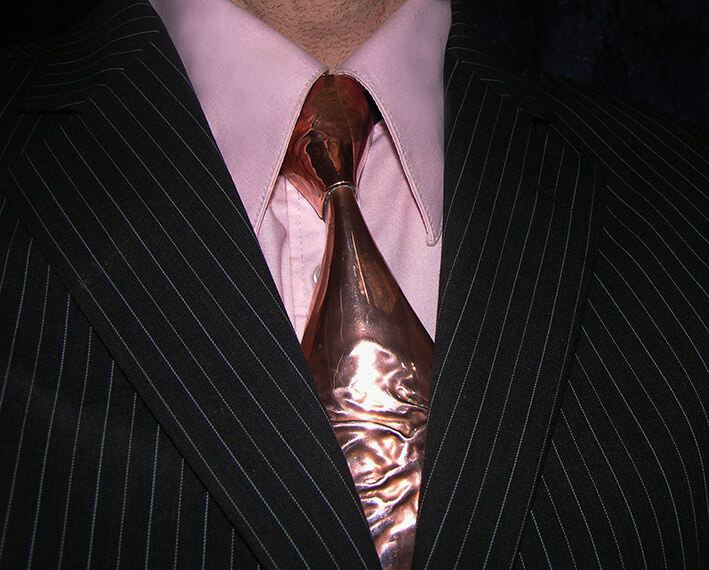 The tie brooch has been created to simulate an accurate look of a real tie. They are produced and coated in materials that exploit their solid construction and make possible a whole new realm of previously unexplored materials for use with the tie. Feathers, polished, beaten or patinated copper, chrome and fret cut detail are several examples. The ties when finished are almost as comfortable to wear as their original fabric alternatives. Filled and backed with a soft suede liner they are secured with a choice of clip or neck elastic fittings. Mat: Patinated copper with polished highlights, suede. Mat : Polished, beaten copper, suede. Simulated shirt in patinated copper. Material : Patinated copper, suede base. Though this item is not currently for sale the techniques, materials and skills that constructed it are still being employed by us. Please enquire if interested.